Today we have reader Nicole sharing an awesome 3-ingredient — YES, 3-INGREDIENT! — chocolate muffins recipe. Nicole is a group fitness instructor and military wife, who is obsessed with clean eating. She loves her food to be simple, easy and healthy! I found this recipe for flourless healthy chocolate muffins, and thought YUM — so simple and easy. However, when I made them, the taste was slightly off, so I have altered the original recipe a bit to make what I think is a really tasty, healthy treat! So not only is this recipe so easy, but it also makes the moist, fluffy and delicate muffins. I mean, I don’t know if I would even consider them a muffin because you can call it a cupcake as well. If you found a healthy frosting recipe, it could probably rock on these. Anyways, they are super bomb. You only need three ingredients, although I recommend adding chocolate chips as a fourth. And you will also need a food processor. 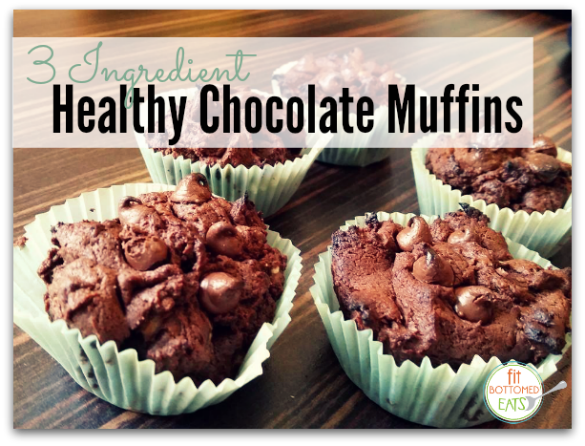 Who knew three ingredients could be all you needed for such a healthy and tasty chocolate muffin?! Combine all ingredients in food processor. Process until blended well. It will be very sticky! Then mix in the chocolate chips (if using them). Fill cupcake liners up almost to the top (they hardly expand). Bake for 13-14 minutes. what ingredient makes this recipe sweet? Is it the peanut butter because the cocoa has no sugar. I’m a lazy cook and I love anything with less than five ingredients in it. Will definitely add this to my list of healthy desserts to make. I’m sorry to say that these chocolate muffins were not very good. I followed all the directions perfectly and it only made 5 muffins. It also took an extra 5 minutes to bake and they still came out a little gooey, and there’s nothing wrong with my oven. The taste wasn’t very satisfying, the only thing that tasted sweet at all was the chocolate chips I added. Maybe honey or something else sweet should be added to this recipe. I have to agree with Jessica. They taste pretty disgusting and it did take forever to bake until done. I ended up throwing them away. Maybe there was a missing ingredient not listed? I used really really ripe bananas. (Almost black) and they were definitely sweet enough. So the recipe was really good tasting but the consistency was gooey. I baked for almost double the time! And still not fluffy. Hi, I love the idea! I was wondering if it would be ok to add in some baking soda. If so, how much should I add in it? Yum! That looks so good, and things I always have in the house!! I love that it’s naturally gluten free. These look great- any idea on the nutritional info? On Weight Watchers so I want to figure out how many points it’d be! I just made these tonight and doubled the recipe. I added about 2Tbs of pure maple syrup for a bit more sweetness.. Kept them in the oven for about 10 min longer. They were quite dense and creamy, as expected. My family and I think they’re a nice yummy treat. I’ll hang on to this recipe. Thank you for sharing this recipe! I’m always on the lookout for something gluten free and easy.